In Part One of this series, we covered the musical importance of the piano accompanist. In the following weeks, we will look at some of the greatest accompanists from the last 100 years, and some great recordings from each. Each week will feature a different accompanist, and feature some cd and, where possible, video recommendations. 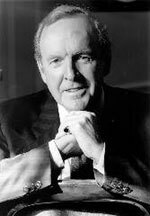 The late great Geoffrey Parsons was an Australian pianist, and like Gerald Moore before him was primarily known as a piano accompanist to many of the world’s greatest singers (though he accompanied many instrumentalists, too), including Elisabeth Schwarzkopf, Victoria de Los Angeles, Janet Baker, and many more. As stated in this article from The Independent newspaper, Parsons was for some time initially overshadowed by the the great Gerald Moore, but he quickly came into his own, becoming respected in his own right as one of the greatest of accompanists, and leaving a plethora of wonderful recordings behind him. 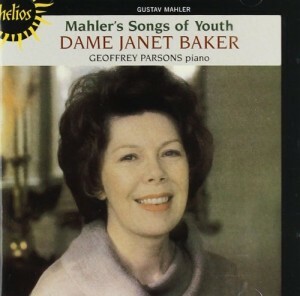 Here Parsons is accompanying the great British Mezzo-Soprano Dame Janet Baker, singing Maher‘s Songs of Youth. This is a wonderful rendition of some of Mahler’s early works, written in 1880, and as is so aptly put in Arkiv Music‘s short editorial note here about the piano accompanist, ‘Parsons brings an equal mastery to the accompaniments, which rather wonderfully manage to suggest their own orchestration while remaining thoroughly pianistic’. A must-have in the collection of any serious Baker or Parsons enthusiasts. 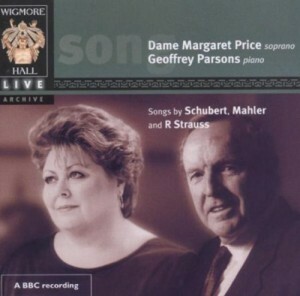 This second CD sees Geoffrey Parsons as piano accompanist to another Dame, the great Welsh soprano Margaret Price, who died recently in 2011. As her long time accompanist, this is a rare live recording of Price and Parsons, and her debut in Wigmore Hall, London; it perfectly captures the absolute musical symmetry between singer and accompanist. Hilary Finch at classical-music.com writes here of Price’s ‘high beauty of voice’ and that ‘Geoffrey Parsons, accompanying, answers with no less meticulously judged tones of voice and pacing’.